Kung Pao chicken is a classic dish in Szechuan cuisine, originating in the Sichuan Province of central-western China. The dish exists in both traditional Sichuan and Westernized versions; the latter is more popular in the United States and Canada. Left: A traditional version of the dish, as served at a Sichuan restaurant in Shanghai. 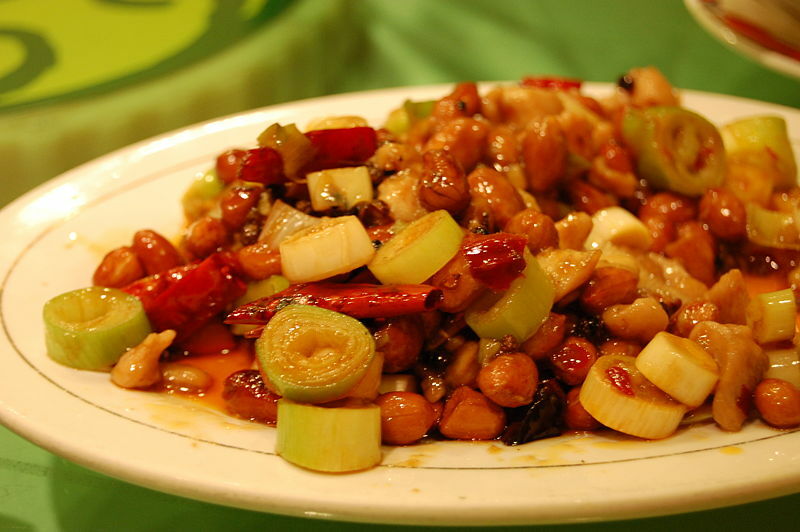 The original Sichuan version of Kung Pao chicken, uses chicken as its primary ingredient. In this original version, diced chicken is typically mixed with a prepared marinade. The wok is seasoned and then chili peppers and Sichuan peppercorns are flash fried to add fragrance to the oil. Then the chicken is stir fried and vegetables, along with peanuts, are added. Shaoxing wine is used to enhance flavor in the marinade. 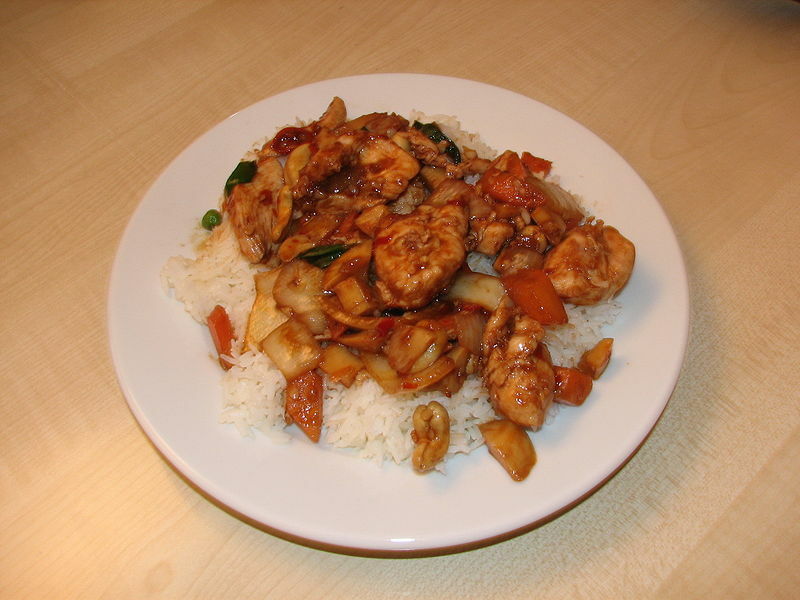 Kung Pao Chicken is considered an Asian delicacy for most. It starts off with fresh, moist, unroasted peanuts or cashew nuts. These are often used instead of their pre-roasted versions. The peanuts or cashew nuts are dropped into the hot oil on the bottom of the wok first, then deep fried until golden brown before the other ingredients are added. The most important component of the dish is handfuls of Sichuan peppercorns. It is these peppercorns that give the dish its distinctive numbing flavor. Use of hot and numbing flavor is a typical element of Sichuan cooking (see, for example, Mapo doufu). Westernized versions, usually called "Kung Pao chicken," commonly consist of diced marinated chicken stir-fried with skinless unsalted roasted peanuts, chopped, sliced, or diced red bell peppers (as well as other vegetables such as green bell peppers, celery, Chinese cabbage, water chestnuts, and carrots), sherry or rice wine, hoisin sauce, oyster sauce, and chili peppers. Although chicken is traditionally used, seafood items such as shrimp or scallops, or other meats such as beef or pork, are sometimes used in place of the chicken (although typically only a single meat or seafood is used). It can also be prepared with tofu instead of meat. Left: Westernized version of Kung Pao chicken, served in London. In order to prepare Western-style Kung Pao chicken, bits of diced raw chicken are marinated, then dusted with cornstarch, and then a Chinese wok is heated on a high flame, without oil, until it is quite hot. A swish of the ladle spreads a couple of teaspoons of peanut oil, then the chicken is flash fried in the hot oil to bring out the flavor of very slightly charred or grilled meat, but not so long that it loses its juices or tenderness. Next, grated garlic and the vegetables are added, followed by Chinese rice wine, along with a sweet sauce. A tiny drizzle of sesame oil provides the tang, peanuts are added, and the dish is ready in about one and a half minutes, from the time the oil first hits the wok. Whereas the original Chinese version of the dish includes Sichuan peppercorns as an integral ingredient, the Western version does not. Kung Pao chicken is a very popular staple of North American Sichuan-style Chinese restaurants, and many recommend using it as a measure of the skills of a chef.